Luke Paddock believes the IBF Youth Lightweight Title will be his ticket to the top in boxing. ‘Cool Hand’ will compete in his fourth title fight and he is desperate to get the victory after suffering defeat in his last two fights for belts. A late pull out by Adam Hague means he now faces Derby’s Myron Mills for the version of a world title. The pair weigh-in at Grosvenor Casino Walsall at 3.00pm today (Friday). 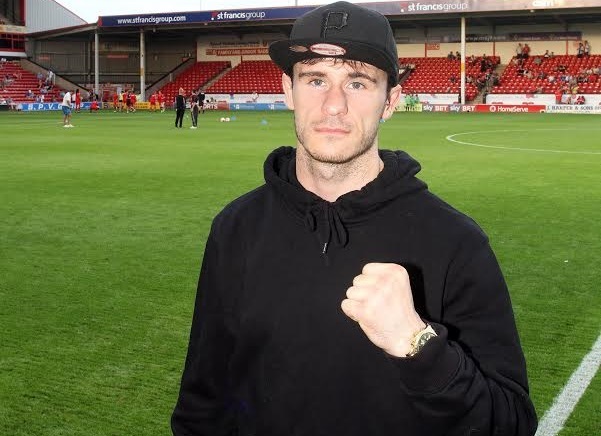 The home-town fighter told bcb-promotions.com he is delighted to be able to go for the belt in front of all his fans and believes this will give him the advantage on the night. “He is in the lion’s den,” Paddock said. “I have sold loads of tickets and I appreciate everyone who is coming down to support me. “I will have everyone behind me and it will motivate me so much. “I don’t feel the pressure of the occasion. I only have his two fists coming at me, not all the fans, they are there to support me. It comes down to us two at the end of the week and I can’t wait for it. “It is crazy. For the last 10 weeks I have been ecstatic since I have found out I am boxing for a world title in my home town. It baffles me still but my dream can come true here and I am going to make it happen. “This is what I want. I am in boxing to win belts and be number one so it is very exciting times. It is a legitimate world title and that will just catapult me straight up to where I need to be. It will put me in contention to get some big fights on some big stages which would be brilliant. The Bloxwich boxer is expecting a tough contest against undefeated Mills, who stepped in on Tuesday evening to replace Hague. “I’m disappointed Adam pulled out but that’s boxing,” added Paddock. “All the hard work has been done now and Myron comes into this with an undefeated record and plenty of good things being said about him. Fair play to him for stepping up. It’s a great match and a tough fight for us both but that’s how it should be; we’re fighting for a version of a world title. “I presume he has a game-plan and so have we. I respect him. He is a good lad and he is coming down to fight me in my own town and I have a lot of respect for that. “I have a good amateur pedigree and I can stand there and trade if I need to. I can duck, weave and dive and I am willing to walk through walls as long as I get that belt back to Bloxwich. Paddock is thrilled about the doors this fight could open for him and he feels he will have enough on the night to edge past the 21-year-old. “Hopefully some big promoters will knock on my door and I am willing to fight their top lads. There will be money involved and I could have trials. “Matchroom could come looking or Frank Warren so it will just give me so many opportunities. “This could be my chance at the big time and that is massively motivating to have those rewards at the end of it. It makes it all worthwhile. “I am not daunted by it. I have kept myself grounded and I am just focusing on this fight. Hague is no mug and I am sure he will want it just as much as I do. “I think I will come on stronger towards the end. I want to have a look at him for the first couple of rounds and size him up and then I can settle and get behind a nice sharp jab. “I believe my timing will be key, that beats both speed and power and I know I will get the job done. Tickets for ‘the World Awaits’ are priced at £40 on the door from 6.30pm tomorrow.